It's just a few weeks since the man with a smart scale in his hand and a big smile on his face bought back the business he sold just two years ago. 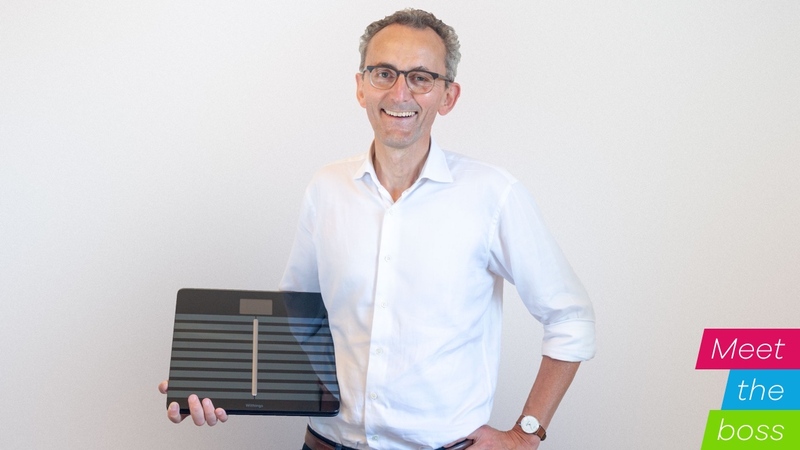 On the 31 May 2018, it was made official; Withings co-founder Eric Carreel had successfully taken back the connected health business he and Cédric Hutchings sold to Nokia. The figure that Carreel paid to buy it back remains undisclosed, but it's clear that he is relishing the prospect of Withings being an innovator in the health space once again. "There are two reasons that pushed me to come back," he tells us. "This is a fantastic team and I really like working with this team. We also are at the beginning of a big story. One where we can really help people with their health through their daily life." So let's do a quick recap. Withings was sold to Nokia in 2016 for €170 million (roughly $200 million) to help the company make a bigger push into the connected health space. During that time we witnessed Withings products go through what felt like an extensive rebranding process as Withings' companion smartphone app also evolved into the more health-focused Nokia Health Mate. Fast forward to February of this year and Nokia announced it had initiated a 'review of strategic options for its Digital Health business'. That review included both Nokia's consumer and enterprise products, covering its hybrid smartwatches, smart scales and digital health services. A leaked memo from Nokia's chief strategy officer Kathrin Buvac to employees revealed that the company saw no future in its health tech business casting further doubt on the future of the division. Then came the speculation and the rumors. Ones that suggested Nokia's digital health business may be saved by one of a number of interested suitors. Both Alphabet's Nest and Samsung were among the companies apparently mooted to be interested but in the most unlikeliest of resolutions to this Nokia Health saga, it was Carreel who ended up stumping up the cash to bring Withings back home. Before we get onto the topic of Nokia's handling of the health business it acquired, let's go back to that time two years ago when the prospect of a sale to Nokia was on the cards. "We were at a point where the fitness market was growing quite fast, but our feeling was that we wanted to go more into the direction of health," he explains. "To do that you need to work with hospitals and doctors, do detailed research and it takes time to work on those things and can cost quite a lot of money. At that time we didn't have enough money to go into this health space. Nokia was very convincing at that time to push into this health area. They convinced us that they could do a very good job long term." With Nokia absorbing the French-based startup founded back in 2008, Withings co-founder Cédric Hutchings was put in charge of the company's digital health business before moving into an advisory role. Carreel tells us he is still on very good terms with Hutchings and the two remain good friends, continuing to share conversations between Paris and San Francisco. So what is Carreel's take on what happened when Nokia took over? "I think they really tried to pursue what we wanted to do with a fantastic team," he says. "They've done something very difficult, which is to change the brand and go from Withings to Nokia. It is a difficult thing to do because they tried to do it in one day for all the products. The fact is, this business was not doing good for them and the priority for them was the B2B business, which is 99.9% of their business today." Withings' very first product was its WiFi Body scale. Then came a blood pressure monitor, followed by its first fitness tracker in 2013 and its Activité smart analogue watch launching in 2017. Those devices together with its sleep tracking tech will remain at the heart of the company's vision to address health in a "really normal way" as Carreel puts it. These are the devices where he believes Withings has innovated and fully represent the company's philosophy to help people with their health in very non-invasive way. "The Withings DNA is to introduce products that have no constraints and are always very easy to use," he tells us. "A lot of people have a scale in their homes and it's natural to go on the scales regularly. Then there is the wrist, where Apple is doing a very good job and has the most advanced smartwatch. We believe we are doing a very good job with the classical mechanical watch with our range of our products. The third place to track is under the mattress, we spend a lot of hours a day on our bed and we can make a lot of measurements like heart rate, your breathing rate, pulse oximetry. These three places remain our priorities and the way we want to address health." Carreel has only been back at the helm of the new Withings for a few weeks, so future areas for exploration have yet to be defined. What is clear is that innovation in health tech remains the focus. "To define our next priority we have to combine what we are able to do, what doctors and hospitals are looking for their patients, what those patients want to use themselves, what the insurance system is ready to contribute, what is the price of this solution?" Carreel says. "A combination of all these factors will decide what we want to do next whether that's with scales, something on the wrist or some new blood pressure monitor." Withings hardware collects data and it's that data that ultimately dictates how useful these devices can be whether it's doctors, patients or anyone interested to closely monitor their health. "If you want to help people you need to be constantly in contact with them," he says. "We are just at the start of this new era of how we enter conversations with people and how we help people in their life related to health. Nobody today has a good solution for this." Withings is not alone in exploring the possibilities of serious health tracking, whether that be from the wrist or other parts of the body. Apple, Samsung, Garmin and Fitbit are among the companies that are beginning to cast a keen eye on life beyond fitness and sport. Something that Carreel is all too aware of although doesn't seem concerned with regards to Withings' own ambitions to conquer all things health. "If you purely look at wearables and you see what is happening to Fitbit and other companies, it's not an easy time for the space. We consider ourselves in a different market, more towards health than fitness and wellness. With wearables on the sport side and the fitness side, you have the likes of Garmin, Fitbit and Apple. "I'm not massively familiar with what Fitbit is doing with health, but I do not consider Fitbit is playing in the health area. I do consider Apple being in this area, and they are doing a lot of research. We are clear about what we want to do with health and how you can help people near or with chronic disease." In the short term, the task is to reinstate the Withings brand before the end of 2018 while Nokia's Health devices remain on sale for now. New innovations are being promised, but it remains to be seen whether those will land this year or we are made to wait until 2019 to see whether Withings still has what it takes to excite and innovate.